The Maxi Dolphin 65’ by Luca Brenta represents the latest concept in medium-light displacement yachts, designed for high performance under sail without sacrificing interior space. The accommodation, in fact, includes a large two-berth owner’s cabin located forward, an immense open-space saloon amidship – with the galley area in full view – and two aft guest cabins, each with twin berths. All the cabins have their own en-suite bathrooms. Accommodation for two crewmembers is located in the bow. 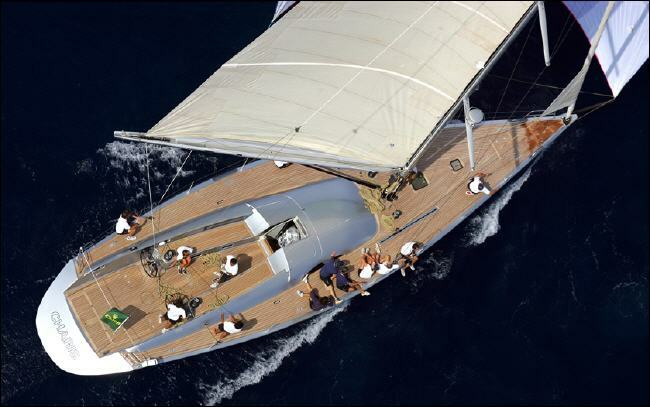 The Maxi Dolphin 65’ by Luca Brenta thus offers both performance and comfort. This difficult to achieve balance is the result of careful research by Luca Brenta & C., which has been used to maximum advantage by the skilled construction work of Maxi Dolphin, combined with an attractive quality/price ratio. The deck, typically Mediterranean with its large cockpit “furnished” with long seats and a centre table, has been designed to be extremely liveable under the clear Mediterranean sky. Some shade is nevertheless provided by the foldaway bimini incorporated in the low-profile sleek deckhouse. The deck has been given a touch of elegance and “warmth” by the addition of areas of teak planking. The clean lines of the deck are accentuated by the careful positioning of all the halyard and rigging winches immediately forward of the two steering wheels. This particular design recognises the current concept of “easy sailing” and helps separate the area dedicated to social activities from that actually used to work the yacht. 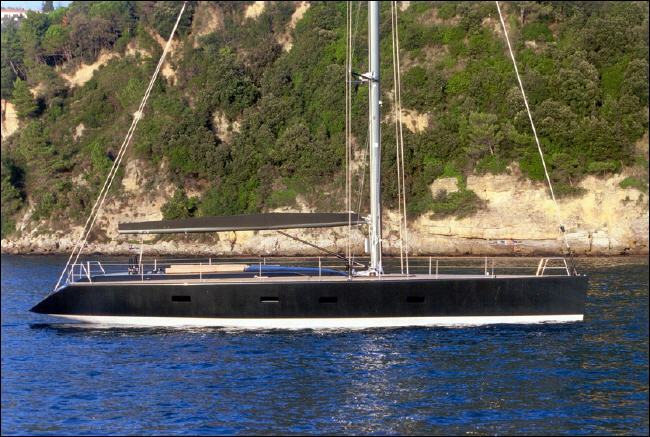 In fact, thanks to the electric winches and hydraulic pistons used to adjust the sails, the yacht can be comfortably handled by just two people. 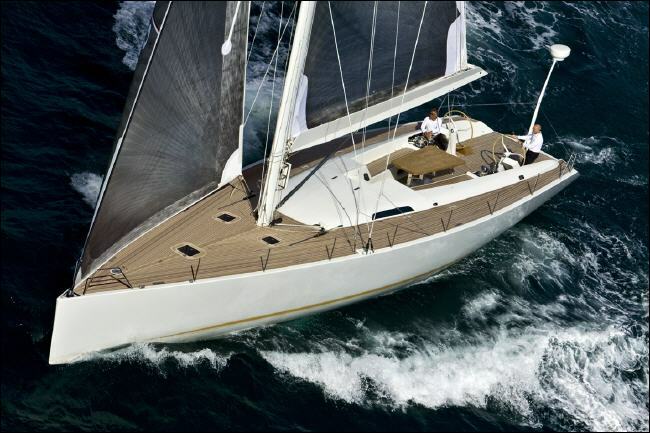 The Maxi Dolphin 65’ by Luca Brenta for the first time incorporates a new technical feature in the form of hydraulic pistons for adjusting also the mainsail as well as the genoa. The split sail plan with its splayed crosstrees includes a genoa mounted on the reefing gear and a full-batten mainsail which can be reefed down to the wide boom using lazy jacks. 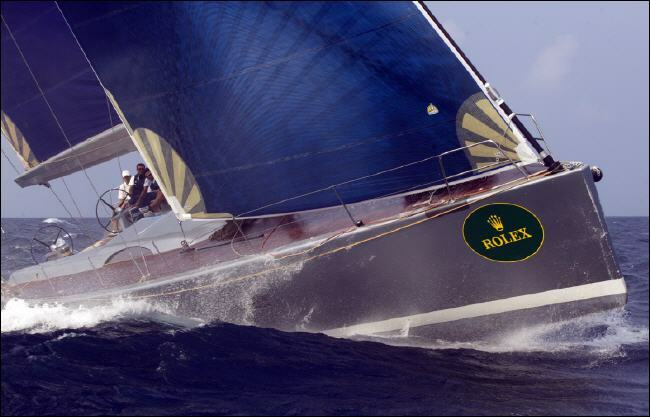 For sailing downwind, a large gennaker is run from a two metres long retractable bowsprit fabricated in carbon fibre, as is the mast. The stern – that can be opened by means of two hydraulic pistons – includes space for a 3.8 metres tender, another unique feature on 65’ yachts. The interior of the Maxi Dolphin 65’ by Luca Brenta, which the designer has elaborated in full agreement with the owner, is based on minimalist aesthetic principles with great attention paid to detail. The furnishings abandon the traditional layouts and are simpler, ordered and more effective, both in form and in the allocation of space. The teak panelling and light wood furniture create a peaceful contrast to the bulkheads and the exposed hull structure, which have been painted white to brighten-up the interior. A rather pleasant touch is the internal flooring on which the classic mahogany with light maple strips has been replaced by teak “tiles” laid on a false floor with the grain of each tile running at 90° to the next.